Shashi Tharoor is the Indian Minister of State for Human Resource Development, Member of Parliament (MP) from Thiruvananthapuram of Kerala, an author and a columnist. Until 2007, he was a career official at the United Nations, rising to Under-Secretary General for Communications and Public Information, but resigned after losing to Ban Ki-moon in the 2007 election for the Secretary-General. In a time when the Indian publishing scene is welcoming the third book of Amish’s The Shiva Trilogy, we can’t help but look back at novel ideas for writing. It was by pure chance that I chanced upon this book written by Shashi Tharoor back in 1989 and I wondered if this may have inspired Amish in some way. 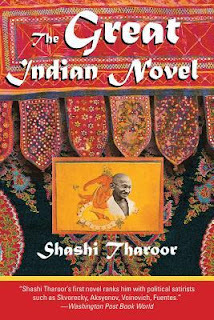 Tharoor takes characters from the Mahabharata and puts a real world spin on it. Like the sage Ved Vyas becomes VV ji and Lord Ganesha, the scribe of the original Mahabharata, becomes Ganapati, a South Indian boy sent by VV ji’s friend Brahm. The book, like the original Mahabharata, also has eighteen “books” titled in allusion to other literary works, and flows similarly to the great epic. What I like in this book is the effort to bring Mahabharata as a chapter in recent Indian history. Mr. Tharoor puts his thoughts directly, as is evident from the opening line of the book. The language is pure, the comparisons are apt and the humor quite refreshing. However, the book does feel slow and painful to read in parts, because of the context itself. And that makes the humor feel repetitive. It’s a little more tougher to digest if one has little or no knowledge of the historical events that are being discussed. Overall, I feel this to be an interesting read. However, it would appeal more to the reader who enjoys satire and also is really interested in politics.